Using probiotics for candida is a very important part of the candida cleanse and candidiasis treatment. Especially since candida and yeast infections are usually caused by candida overgrowth in the gut. Probiotics supplements work by populating the intestines with beneficial organisms that can help fight the candida overgrowth and restore these imbalances. Choosing the best probiotic for candida: it is important to use the right probiotic strains. Different probiotic strains have different properties and as such, they have different uses, benefits and side effects. Taking the wrong probiotics can cause die off symptoms and side effects such as bloating, gas and other digestive issues. In some cases, it can even make the candida overgrowth worse. Choosing the best probiotics for candida often causes confusion. There are many probiotics supplements on the market. Most of them however, are not specifically designed to treat candida. This means effectiveness and safety. During the initial candida cleanse, the focus should be probiotic strains that their main characteristic is yeast and candida elimination. It is important to make sure the probiotic strains used are backed up by science as both safe and effective for candida. The fact that a probiotic strain can kill candida is not enough. it also has to be safe and gentle. Many people are surprised to learn their candida probiotics supplements caused side effects. Typical side effects may include digestive issues such as bloating, gas (flatulence), constipation, diarrhea and abdominal pain. In some cases, skin rash and even acne. In many cases, the cause of these side effects was that the candida probiotics contained or were made using dairy, gluten or other common allergens. This is a common problem we see in many probiotics for candida. Many use probiotic strains that contained dairy or gluten. While these may be OK for a healthy person, when you have candida overgrowth, you may have sensitivity to these. Hence the side effects. These probiotics side effects are unnecessary and can be easily avoided. The candida probiotics supplement should be dairy and gluten free. Another common problem with many probiotics is that they are either not strong enough, or that they do not meet their label claim. One study that tested 15 different probiotic supplements found that only 4 out of the 15 products (27%) that had specific claims of viable organisms met or exceeded their label claim (1). Many probiotics for candida need to be refrigerated. Others may be potent at the time of manufacturing, but lose their strength due to low stability or poor manufacturing methods. This means that by the time you get them, they may lose their strength significantly. The probiotics need to survive the stomach acids so they can be active in the gut. Our recommendation is to take probiotics for candida for 4 weeks as a part of the initial candida cleanse. When most of the candida overgrowth is balanced, you may not need to take probiotics for candida anymore. The decision will be based on the progress made and symptoms you may still have. During the initial candida and yeast infection treatment, the priority is to balance the yeast and candida infection quickly and safely. Using a single probiotic strain is preferred over multiple strains at this point, as it simplifies the treatment. There are just less factors that need to be considered. When most of the candida overgrowth is balanced during the initial treatment, you may not need to take candida specific probiotics anymore. Our recommendation for probiotics at this phase, is to take multiple probiotics strains that are still effective for candida but can also support the immune system and overall health. This is a known strategy to help prevent candida and yeast infection issues. Lactobacillus probiotic strains such as the Lactobacillus acidophilus are considered a very good choice for that purpose. If you are looking for probiotics to prevent candida, see: probiotics to prevent yeast infection. Latero-Flora is our preferred choice of probiotics for candida during the initial yeast infection and candida treatment (week 1-4). It has been a part of our natural protocol for candida for many years. Latero-Flora is using the Bacillus laterosporus, a patented probiotic strain shown by research to be very safe and effective for candida overgrowth. It is best used during the initial candida and yeast infection treatment, as a single probiotic strain that is very fast acting and potent, but also very gentle and safe. The Bacillus laterosporus was suggested by research to work very quickly against candida. 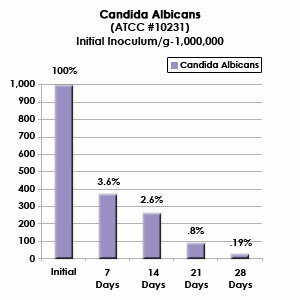 As you can see in the above study results, major candida killing properties were observed in 7 days. Safety testings have confirmed Latero-Flora is completely safe with no indications of toxicity or adverse side effects, even at extremely high dosage. Another benefit of Latero-Flora, is stability. This strain is one of the most stable probiotics for candida. Bacillus laterosporus has a natural ability to encapsulate itself when exposed to different environment changes (spore-bearing). This means it can easily pass the stomach acids and become very active in the body. It is also very stable in room temperature and doesn’t need to be refrigerated. So you can take it with you wherever you go. Latero-Flora can also help to promote healthy digestion. In one study, participants who took Latero-Flora, reported significant relief to many digestion issues they previously had. This is an important benefit during the candida treatment, since digestive issues are very common. (See study results). Die Off Symptoms From Probiotics. A common issue with many probiotics supplements is the the added ingredients. The ones you see listed under the other ingredients section. Usually in very small letters. Toxic fillers and binders are often added to reduce manufacturing costs. These can make ingredients bind together or look better. Lubrication substances are commonly used to prevent powders from getting stuck to the machines. This has been a very serious concern raised by many health authorities. Not only our bodies do not need these toxins, there is a growing number of evidence suggesting these toxins can cause health issues and even cancer. Sensitive to the probiotics or the added ingredients. The Probiotics are too aggressive. This is a common misconception. Die off symptoms do not mean that the treatment is working. What It means that the amount of toxins released by the dying candida is more than what your body can safely handle. Choosing probiotics to kill candida is not enough. They have to be safe too. Using yogurt and other dairy products as a source of probiotics for candida has been very controversial. Dairy products are known to cause digestive issues to many people and are the top foods to avoid during the candida treatment. It is possible to get probiotics from natural fermented live cultured yogurt. This may be an option to consider when you are healthy. Consuming yogurt when you have candida overgrowth however, can also backfire. The main concern is sensitivity to dairy. In addition, stability, quality issues, and contamination risks make yogurt risky when you already have a compromised gut flora issue. To learn about our natural protocol for candida: candida cleanse. Recommended Candida Supplements – Experts Guide MOST POPULAR ! Candida colon cleanse, enzymes, antifungals, candida vitamins. Risky candida supplements you should avoid. Critical mistakes that can ruin any candida or cleansing program.